I’m a huge Google Calendar fan! It integrates with nearly everything I’d want/need it to, it makes it easy to visually see what’s going on, the sharing features are remarkably simple to use, and overall it is just magnificent (and no, Google isn’t yet paying me to say that). I’ve recently started creating a Google Calendar for my courses so that students can see at-a-glance dates for homework submissions, class meetings and lecture topics, class cancellations, etc. I plan my entire course out at the beginning of the semester, so as not to have a mid-semester crisis, and using Google Calendar makes this all that much easier. I start by creating a spreadsheet with the following column headers: Subject, Start Date, Start Time, End Date, End Time, All Day Event, Description, Location, Private. This becomes my template for importing lots of dates/events at once. * You can download a template I’ve created for you here: http://db.tt/u1YfmBI. You may have to open it in Excel. Start by filling in the Subject. What you enter in the subject will be the title of the event. Continue to fill in the event details by entering the Start Date, Start Time, End Date, and End Time. If the event is not an all day event, enter “FALSE” in the All Day Event column for each event. All of these columns must be filled for proper import. The Description can be as long or as short as you like. For my courses. I typically put a short outline of what I intend to cover that day in class. I may also include specific information on any course assignments that may be due. This is the only column that can be left blank. For the Location, I generally include the room number of the classroom we meet in. This could be as simple as a room number, or as complex as an address. If you include an address, you can easily click and access Google Maps directions to the address. The Private column is just what you’d think, this will make that particular event only available to you and those you’ve given access to. If you are sharing this calendar in any way, type “FALSE” in the Private column for all events. Complete one row for each event you’d like to import. Be sure and save the changes as you go. You’ll need to access this file in the following steps, so remember where you saved it! Once you’re ready to import, login to your Google Calendar account. If the calendar you want to import to does not yet exist, create it by clicking “Add” located in the bottom-left-hand corner of the “My Calendars” section. Now that you’ve got your calendar created… Under the “Other Calendars” section, in the bottom-left-hand corner of the page, click “Add” and click “Import Calendar” from the pop-out. In the Import Calendar dialog, click “Choose File” to pick the file that we created and saved earlier. In the Calendar drop-down, choose the Calendar you want the events imported to and click the “Import” button. 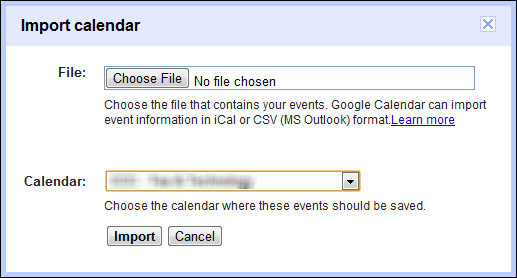 You’ve now successfully imported multiple events to a Google Calendar! If you’re an instructor and you’ve decided to do this for your course, I suggest you continue on by acquiring the embed code for that particular calendar and embedding the Google calendar into your course for your students. Stay tuned for directions on that in a future post. You can find more help on creating and importing CSV files, directly from Google itself, here: http://goo.gl/kBeb.